Can I get paper filters for my coffee percolator? 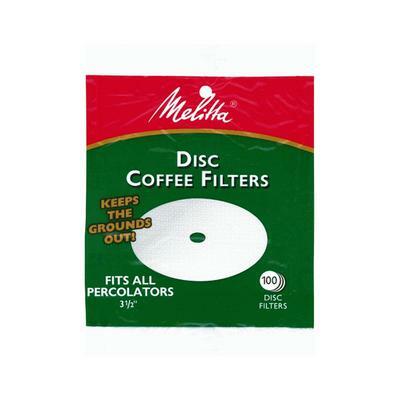 Melitta coffee filter discs for coffee percolators. I have used my coffee percolator for years now, Decades, actually. But then I read about how you should filter your coffee through paper to get rid of the “bad cholesterol”, or some such thing. Is it even possible? Can I get filters for my percolator? When you read about the “bad cholesterol”, that was probably about was presence of cafestol in coffee. Cafestol is found within the oils you get in coffee, and is a stimulator of LDL cholesterol levels in your body. Put another way, if you have high cholesterol and you drink coffee that hasn’t been filtered through paper, that’s probably not a good thing. If you do filter your coffee through paper, the paper filter absorbs most of the cafestol and your problem is solved. As for whether you can get paper filters that fit in a coffee percolator, the answer is yes. Melitta makes 3 1/2 inch filters that fit most percolators. If you can’t get them locally, Melitta Disc Coffee Filters For Percolators . I hope this solves the problem! Comments for Can I get paper filters for my coffee percolator? There are two types of paper percolator coffee filters. One is the disc type / a round piece of filter paper with a hole punched in the center. They fit over the stem and sit at the bottom of the percolator coffee basket. You put the center one over the stem and fill the basket with coffee then put each of the corners over the stem making a kind of package for the grounds. You may have noticed that the percolator basket had some side slots where water pass through so the square 5 punch filters will trap those oils moreso than the disk one hole filters. Additionally,,,no matter what,,, the square papers have more surface area thus more trapping of those oils. just to say,,, what is coffee about... certainly,, it is About Those Oils ! I have liked perc coffee because of the more raw and robust flavor than drip, simply said, more depth of flavor. When I compare the taste of perc with or without filters I prefer by far the non filter brew.